It looks like robbers won't have it so easy stealing from McDonald's anymore. Sorry, Hamburgler. After a string of recent robberies at its franchises across Australia, McDonald's has chosen to partner with security firm SelectaDNA to equip its restaurants with "DNA Spray." Now, if someone shows up who wants a handful of cash instead of a handful of french fries, a small device above the exit will activate during his or her getaway, covering the bandit's skin and clothing with a synthetic DNA strand made up of sixty separate chromosomes. 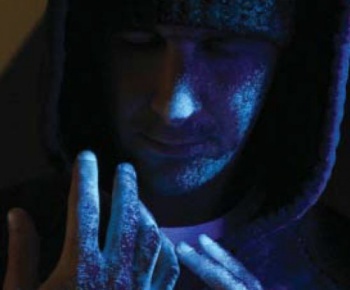 The newly introduced DNA will then seep harmlessly into his or her skin for two weeks (and clothes for six months) allowing the police to reveal the culprit using UV light. The spray is both invisible and odorless, but even if the hapless highwayman notices the deoxyribonucleic acid rain cloud, SelectaDNA assures that its chemical concoction is "virtually impossible to remove." Making matters worse for the offender is that each DNA sequence is unique to the location to which it was installed, meaning a successful forensic identification is 100% admissible in court. Basically, if you get caught in this stuff, you're screwed. According to SelectaDNA, individuals, police, and corporations are showing an average 85% reduction in crime due to what it describes as the "DNA Fear Factor." No, that's not a SyFy channel spin-off of the popular reality show; it's the idea that this process is so effective and/or bizarrely horrifying that criminals probably figure it's easier to make money by simply getting a job at McDonald's instead (or perhaps just by robbing somewhere that doesn't squirt you with forged genetic blueprints). For now, McDonald's is giving this new security system a trial run at seven locations across The Land Down Under, including one unfortunate franchise in Merryland that was recently robbed twice within one week. If things go well, the corporation will be installing DNA squirt cannons on the exits of all 780 locations across the continent.